I wasn’t planning on making a pie this weekend. I really didn’t think I’d feel like it. But I surprised myself by waking up at 11:30 AM on Saturday and having enough energy to get out of bed, go to the coffee shop, procure coffee, look through cookbooks at home until I found something I wanted to make, and then go back out to the grocery store to buy ingredients. Advil was instrumental in making all of this happen. I decided to pick a recipe from James Peterson’s Baking. I’ve had this cookbook for a few years now and I will say that I’ve learned a lot from it, though I’ve found many of the recipes to be slightly imperfect. (I usually end up modifying the recipes I make the second time around.) You just can’t beat a cookbook that has a recipe for anything you could possibly bake. I only had a few hours to make a dessert because we were going to a farewell party that started in the early evening, so I settled on banana cream pie because 1) it’s delicious and 2) it doesn’t require TOO much work, I thought. As usual, it was a little more work than I’d bargained for, but the outcome made it all worth it. I started with the crust, which needed to be pre-baked. I’m not a pie crust expert (yet) but I’ve gained a lot of confidence in this area recently, so I didn’t think it would be a problem. That assumption was incorrect. 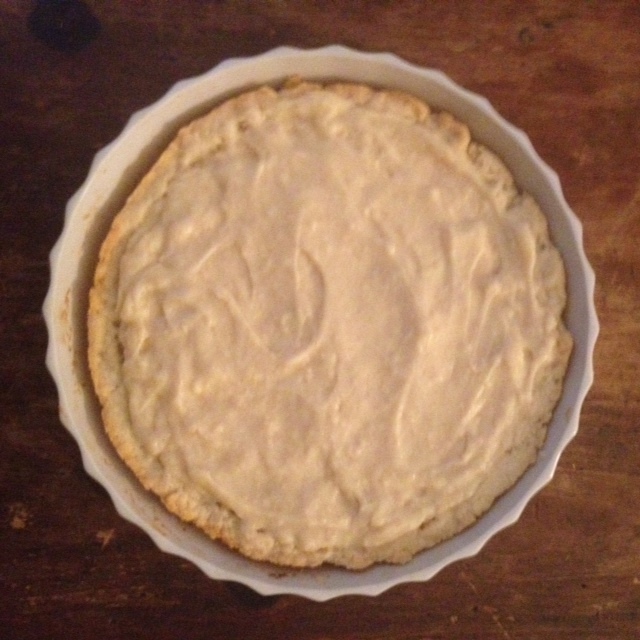 I used Peterson’s recipe for Basic Pie and Tart Pastry Dough. I followed the directions for making it in a stand mixture, which was supposed to be better for keeping the butter cold and kind of clumpy (as opposed to a food processor), but that did not work out so well. The dough came together very, very quickly and when I added the liquid, it was way too wet. I could tell it wasn’t going to roll out easily or turn out the way I wanted it to. Also, I got some nail polish flakes in it, so into the trash it went! So, I started over – after taking my nail polish off – and this batch turned out A LOT better. I used less liquid this time and the dough rolled out very nicely. But my kitchen was very hot and even though I had put down a lot of flour on the butcher block, the dough stuck and I had to roll it back into a ball to roll out again. At that point, I realized I didn’t have a lot of time because I hadn’t even started on the filling, so I just pressed the dough into my pie dish. Not gonna lie, it didn’t look great. I used the end of a fork to crimp the edges and that made it look slightly less ugly. Before I threw it in the oven, I put a sheet of parchment paper over it and put some dry rice on top of that to weigh it down. Once the shell was cooking, I started on the custard for the filling. First, I made the brown butter, which was to be added to the vanilla custard to give it a butterscotch flavor. I actually had never made brown butter until a few months ago. (I had to look up how to do it and found the directions on Simply Recipes to be much easier to follow than those in Baking.) It’s…not hard to make, like, at all. I feel like I thought it was going to be hard because people are always talking about burning brown butter (right? ), but I haven’t burned any yet so…Anyway, After it was was finished, I let it cool on the counter while I got started on the custard. I actually have never cooked custard perfectly. But I did it this time! I didn’t scald the milk and there were no burnt bits on the bottom of the saucepan. I literally felt like a genius after I realized this. (Very cool, I know.) I added the brown butter to the vanilla custard and put it in the freezer to cool down, because I am all about short cuts. While I was doing all of the filling stuff, I didn’t realize the pie shell was sort of burning. Oh, well! No one was going to see it anyway and I don’t mind a well-done crust, so I got over it pretty quickly. I left that to cool as well and went to get ready for the evening. I assembled most of the pie right before I left, except for the top layer of bananas. A layer of custard went on the bottom, followed by a layer of bananas (I used 3), followed by another, thicker layer of custard. Because my shell shrank in the oven, I didn’t end up using all of the custard, so I put it in the freezer so that I could eat frozen custard later! I served the pie after dinner that evening and it seemed that everyone who tried it liked it just fine/maybe a lot! (Somehow, I managed to bring a banana cream pie to a party where only half of the people liked bananas.) I certainly thought it was very good and would definitely, definitely try this again. Directions for the easiest method – making the dough in a food processor – can be found here. Use a 9- to 10-inch pie pan. Roll the dough into a round about 2 inches larger than the pie pan. Line the pie pan with the dough, fold under the edge to make it a double thickness, and make a fluted edge. Place a square of parchment paper or aluminum foil over the dough, making sure it is large enough that it’s easy to pick up by the ends when you remove it. Cover the parchment paper with about a pound of dried beans to keep it from puffing up in the oven. Bake the shell for about 15 minutes, until the edge of the tart turns pale brown. Remove the paper or foil and beans and bake for another 15 minutes, or until the bottom of the shell is golden brown. In a saucepan, bring the milk to a simmer with the vanilla bean or extract. In a bowl, whisk together the eggs, egg yolks, sugar, and cornstarch until smooth. Pour half of the milk into the egg mixture, stir to combine thoroughly, and pour the mixture back into the saucepan with the rest of the milk. Stir the mixture over medium-high heat with a whisk for about 5 minutes, or until it bubbles and thickens. Remove the vanilla bean, if using. Transfer the custard mixture to a bowl, whisk in the brown butter, cover with plastic wrap, and allow to cool to room temperature. Cover the bottom of the pie shell with one-third of the pudding. Slice 2 of the bananas between 1/8- and 1/4-inch thick and place one half of them over the pudding in a single layer. Spread half of the remaining pudding over the banana slices. Place the remaining sliced bananas on top of the pudding, then cover the bananas with the remaining pudding. Refrigerate for at least 1 hour before serving, but serve at room temperature. 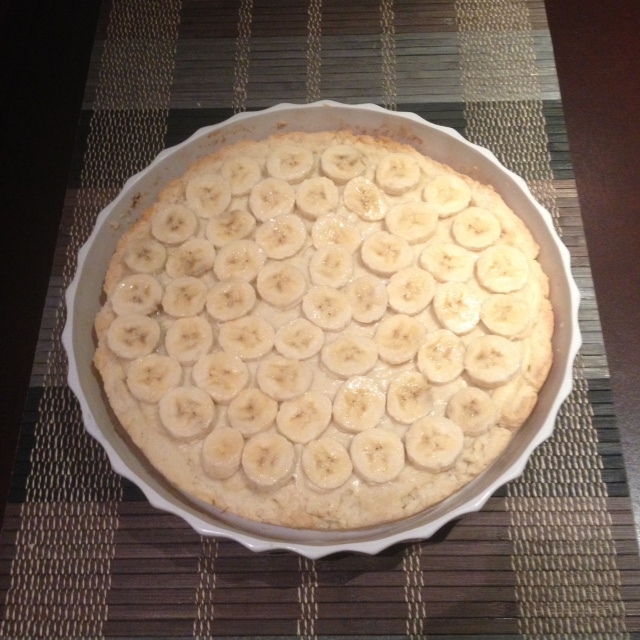 Shortly before serving, slice the remaining banana and arrange on top of the pie.